Face Value: I listened to this book on audio, so I didn’t have the experience of looking at it regularly while reading. But if I had, it would have been more or less respectable, if nothing extraordinary. It’s a little pastel for my taste, and while I understand the Rose motif and Sleeping Beauty reference I would have liked something that included a little more of the harshness of Rose’s reality. That said, this alternate version, via goodreads is terrible. That girl looks nothing like the way Rose is described in the books, half her face is missing and it looks like this book is going to feature sparkly unicorns or something. Does it Break the Slate? Does it ever! I was so frustrated with Rose throughout the beginning of this book. I just wanted her to stand up for herself. And it seemed (at first) like this book was going to follow a traditional Sleeping Beauty/Princess Story format, with the fragile princess being rescued, protected and loved by the strong handsome prince who awakened her. BUT you guys, that is totally a fake out. Yes, Rose is fragile and passive in the early chapters of the book. But what this book gives us is an extraordinary transformation, as Rose learns more about her situation and her previous life and starts to develop the strength and backbone to save herself, made more exciting by the absolute believability of her transformation. It’s a slow progression rather than an instant transformation. And as for that handsome prince business – that gets turned on its head early on, but not at all in the way we expect. Who would we give it to? I hadn’t even heard of this book until it showed up on The Book Smugglers best of 2011 list at the end of December, but I was instantly intrigued. I think it’s a book that lends itself really well to book talks – the quick concept introduction is totally compelling. This one will play well to both the fairy tale retelling crowd, but even more so to the science fiction/dystopia crowd. And if you know audio book listeners, I found this one to be so exciting that there were times I didn’t want to get out of the car. Warning: There are mild spoilers included in this review. I kept out the major reveals, but there are a few things I had to give away in order to analyze them. So if you’re particularly spoiler-phobic, stop now! Review: Rosalinda Samantha Fitzroy is awakened out of stasis with a kiss (actually mouth to mouth resuscitation, and the push of a re-start button) 62 years after being put in her stass tube by her parents. They died in a helicopter crash and Rose somehow ended up in the sub-basement where she lived out the world’s Dark Times in relative safety (if total lack of consciousness). So when Bren, a teenage boy who now lives in the building discovers her and accidentally restarts her stass tube, Rose wakes up, still 16 but now living in a totally different world, the “sole surviving heiress to an interplanetary empire,” UniCorp. No one she knew in her old life is still alive and she has no idea who she can trust. Plus there’s a scary robot out to terminate her. But slowly she starts to form friendships, with Bren, the handsome young man who found her stass tube and Otto, a classmate who was is technically UniCorp property since he was genetically engineered from human embryos injected with alien DNA. She starts to learn more about the world she’s living in now and the world she lived in before. And Rose starts to become the agent of her own protection and her own future. There were a few elements of this story that really made it stand out for me, and really got me excited about this book from both a literary and a feminist perspective. One of the things that’s particularly fascinating about this book is the nature of the setting. So many of the dystopias I’ve read in the past few years take place right in the middle of the worst of it, with society shutting down and our heroes at the mercy of the destruction our current society has brought upon us. 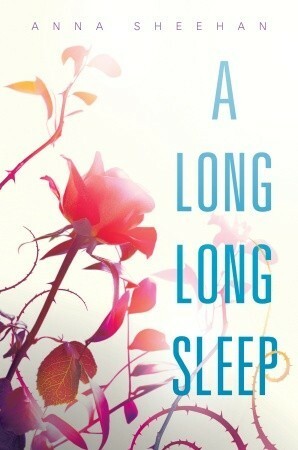 A Long Long Sleep, however, takes place some time after the worst of it. “The Dark Times” as they are referred to, happened while Rose was in stasis. Now, things are “better” – people aren’t dying right and left, many of the problems have been ostensibly solved. But Rose still has to negotiate this new world that bares similarities and some total differences from the one she went to sleep in. It’s is richly realized and terrifying – Sheehan does a wonderful job using the device of Rose’s search for information to explain the world to the reader, and it comes together wonderfully with only a few clunky exposition moments. The biggest, and most exciting surprise for me was the way this passive heroine broke tradition with fairy tales and transformed herself into an active Slatebreaker over the course of the book. Just like Princess Aurora, Rose is awakened out of her unearthly long sleep with a kiss from a handsome stranger. And for awhile, it seems like Bren is going to be our stereotypical leading man. He’s gorgeous, he’s kind to Rose when no one else is, she starts to have feelings for him. It’s what we expected. But then, the story gets turned on it’s head. Bren rejects Rose’s attraction to him, but he doesn’t turn out to be a complete villain either. Instead he becomes a friend, and someone Rose can count on, but there’s absolutely no romance between the two of them. In fact, Bren’s rejection of Rose was a real turning point for me in this book. It was at this point that not only does the story start to really coalesce, but Rose has to start really figuring things out for herself. The real romance of the story is between Rose and Xavier, her first love from before her time in stasis. I won’t ruin anything for you here, except to say that truly, the love between these two characters blooms and matures in a beautiful, sincere way. Of course, Otto Sextus is a wonderfully drawn character, and I would be remiss to mention Bren and Xavier and leave out his characterization. As another outsider, Otto is really the only person who can understand certain pieces of Rose’s experience, and without his support it’s unlikely that Rose would have been able to make the emotional journey she ultimately does. The limitations of Otto’s lack of speech (he communicates telepathically or through written communication on their “netscreens”) actually lend so much richness to the way this friendship develops. The real surprises in this story, and the greatest horror is not actually from the creepy robot trying to murder Rose or even the horrors of the Dark Times that their society suffered. Throughout the book we get hints at some of the terrible things that have been done to Rose, and by the end we realize the full extent and horror of what her parents put her through. And yes, it’s even more horrifying that I thought it would be. Regardless of the fairy tale, or the science fiction elements of this story, Rose’s emotional journey, of coming to terms with her family and figuring out who she is because of and despite them is a powerful one. Rose’s growth over the course of this book is not only inspiring, it’s plausible. As I watched her coming into her own and standing up for herself I found myself wanting to cheer out loud for her. You will too. This entry was posted in Reviews, Young Adult and tagged Dystopia, Fairy Tales, Princesses, Retellings, Science Fiction. Bookmark the permalink.